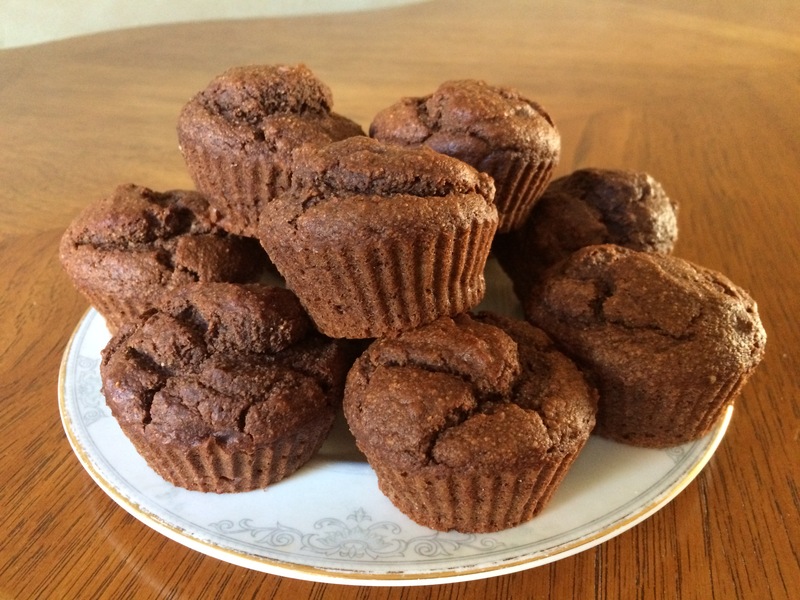 There are plenty of recipes for Chocolate Banana Muffins – all very slightly different – so I’m not 100% sure where I found this one but the muffins are so tasty that it is one of my favourite recipes especially as they store so well in the freezer. Very handy for when the grandchildren come around. Deliciously moist and chocolatey, these muffins don’t need any additional chocolate chips but if you really wanted to, just add some to the raw mix and top with a few extra before baking. The darker the chocolate, the better it is for you! I prefer to make my own oat flour as it is so easy. Just blitz gluten-free oats in a blender until a fine flour is created. Line 12 muffin tins or 18 cupcake tins with cases. Mix together the oat flour, almond flour, cacao, baking powder, baking soda and salt in a medium bowl. In a separate bowl, whisk the bananas, butter, honey, eggs and vanilla until combined. Pour on to the dry ingredients and quickly stir until mixed. Divide the mix evenly between the cake cases. Bake for about 12 – 15 minutes or until a cocktail stick comes out clean. Store in an airtight container, or freeze (if they last that long). This entry was posted in Sweets and Treats and tagged Almond Flour, Banana, Cacao, Chocolate, Gluten Free, Healthy Eating, Muffins, Oat Flour, Oats, Wheat-Free. Bookmark the permalink.